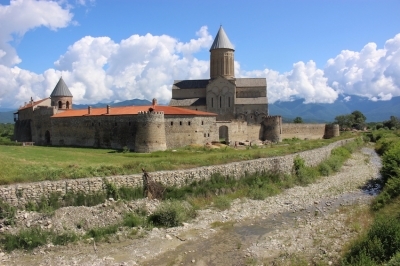 Alaverdi Cathedral is part of the Tentative list of Georgia in order to qualify for inclusion in the World Heritage List. Alaverdi Cathedral is located 2 hours by car east of Tbilissi in a fertile valley at the footsteps of the Caucasian range. Driving there is easy, well signposted and a nice day trip from Tbilissi. There is also multiple guided tour, which combine Alaverdi to nearby Gremi TL (30 minutes away). The cathedral lies isolated in the middle of fields, including famous vineyards and surrounded by a large fortified wall. On a clear day, the backdrop is composed of the white peaks of the Caucasus mountains. Inside the walls is the cathdral, a monastery comlex, a small vineyard and wine cellar. The monastery was founded in the 6th century by a monk, Joseph Alaverdeli, who came from Antioch and settled in a small village, site of a former pagan religious centre dedicated to Moon. At the beginning of 11th century, King Kvirike of Kakheti built a cathedral in the place of a small church of St. George. It was one of the important center of Georgian literacy, with many writers, caligraphers and scibes. Alaverdi was Georgia highest cathedral (up to 51 meters) until the construction of the Holy Trinity Cathedral in Tbilissi consecrated in 2004. I visited the cathedral on a Sunday, while mass was being celebrated. Monks singing renders the visit very nice and atmospheric. There were many tourists though, coming in multiple busses. Entrance is free, but the monastery is closed to visitors. The interior of the church is impressive, with very high ceilings and central dome. Walls are mostly grey, except for a few frescos, some original from the XIth century. Along with Gremi, it makes a nice day trip from Tblissi, with stoppings in wine cellar along the way. You ca see the sketch on Flickr.